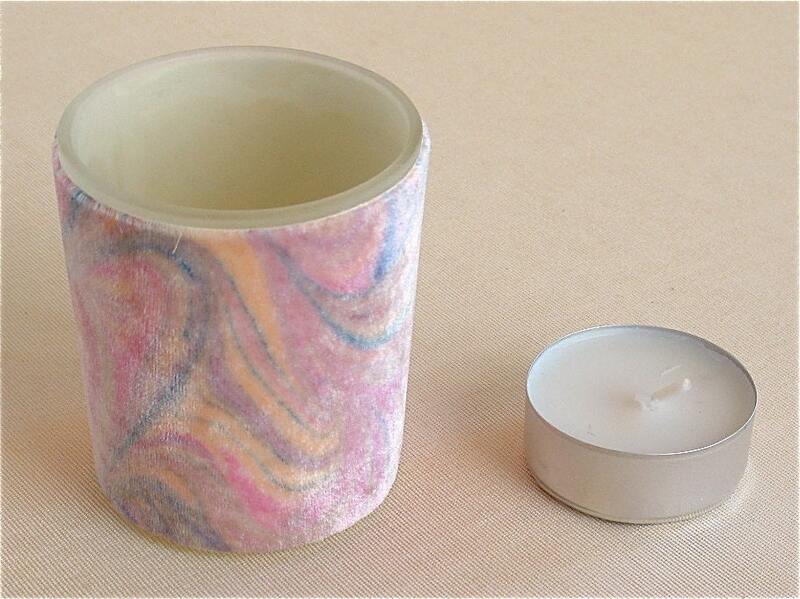 The swirled pinks and blues of the marbled silk velvet makes you mouth water for cotton candy and when lit with a votive creates a soothing soft glow. 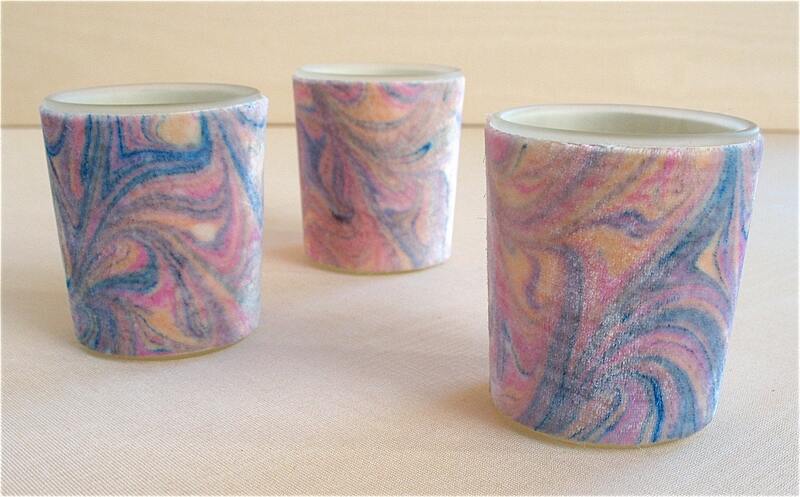 Welcome, and thank you for visiting Brooklyn Marbling to view my one-of-a-kind hand marbled silk pieces for the home. 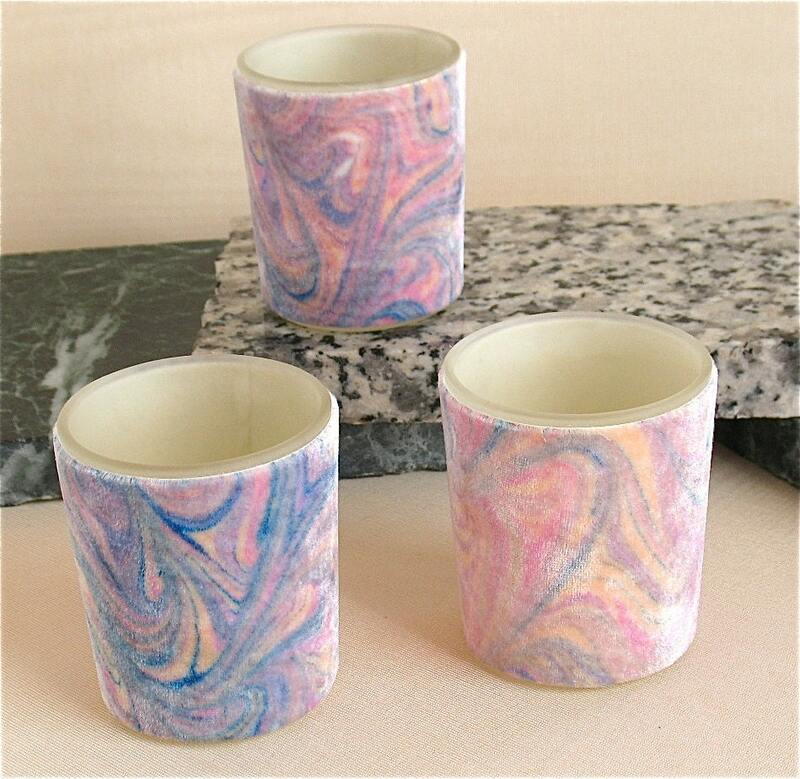 To create this particular set of votive holders, I experimented with marbling silk velvet and then mounted the result onto 100% recycled paper and with that wrapped a frosted glass votive holder. The frosted glass helps provide a soft glow behind the fabric that brings out the one-of-a-kind design and the fuzzy nature of the velvet adds to the softness of the glow. The votive measures approximately 2.5” (6.5 cm) high and has a top diameter of 2” (5 cm). 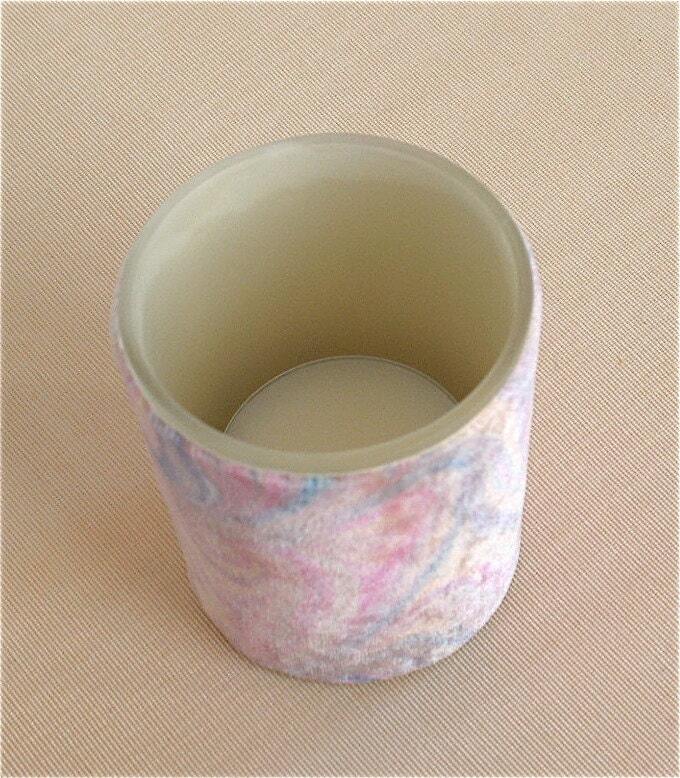 It will hold a standard 10 hour votive candle or 4 hour tea light (pictured with the votive). This set of three votives was created from one piece of silk velvet so be sure to view all the pictures to see how similar and yet completely unique each one is. The price listed is for the set of three. Tea lights are recommended to facilitate easy cleaning. The silk mounted paper is not sealed (to retain the natural beauty of the silk velvet) and therefore the votive should never be submerged or placed under running water to clean. If votive candles are used and you need to remove excess wax, just place the votive in the freezer for a few hours and the wax will pop right out. My votives are not only unique decorative accents; they are also perfect as a hostess gift, wedding favor or that special centerpiece on your dinner table. If you are planning a wedding and would like to use my votives as part of your décor or if you would just like a larger quantity of votives similar in design and color, please feel free to contact me. We can discuss what hand marbled silk I have in stock or I can work with your color scheme and design preference to create the perfect accent for your reception tables or ceremony environment. Please note that a 3-4 week lead-time may be required to ensure a timely delivery. Shipping is done through USPS Priority Mail. If you would like to order multiple sets, please contact me for a shipping quote. I am happy to ship internationally but shipping cost can vary by country. International shipping listed is an approximation. Please contact me for information about price and time frame of delivery.